I am sharing today another layout that I made with beautiful November Scrapbook Kit where we had ABStudio gorgeous products, 49 and Market and Prima flowers along with great chipboards from Creative Embellishments. For this layout I wanted to work with the feathers, which are not something I normally use so this was a little bit of a challenge for me because I never know where to put them ! So I had this idea of using all of them so they would be the focus of my page. First thing I did was gesso the background, then I cut little peaces of paper for the top and the bottom that I adhered making a triangle directed to the center and reaching the bottom. I used AB Studio stencil with Paste. I took the feathers and adhered them from the top to the center, and from the bottom to the center also. I painted them with white gesso. I put some Icing Paste to give color just a little and added the trim lace on top and bottom. I finished by adding flowers, tags, bird and Art Stones. I hope you were inspired !! Hello everyone ! so happy to share new creations with brand new November kit ! 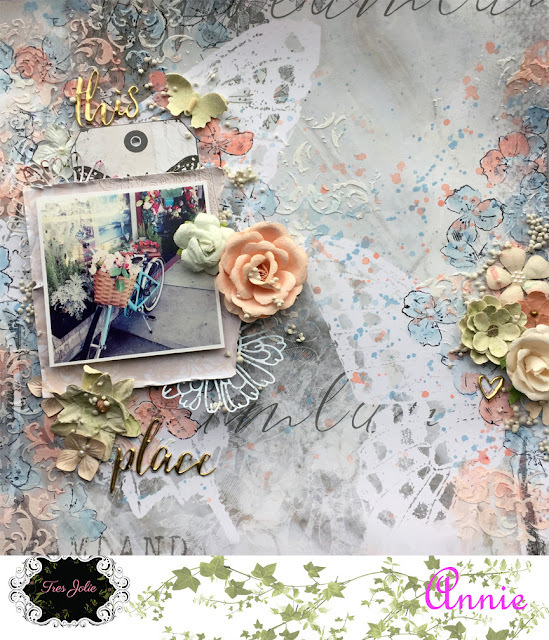 Today I am sharing a layout made with the Scrapbook kit and a few things from the MM kit. This paper is so beautiful with the 2 big butterflies that I didn’t want to hide them. That is why I tried to keep it simple. On the background I used the stamp from AB Studio and painted them with Watercolor from my stash. I chose colors that matched my photo. The die cut flowers you see behind the photo were made with a friend’s die cut I tried on my scrapbook weekend. I cut the tag from one of the AB Studio papers. I added some flowers and Art Stones. Hey everyone, Kim here. Boy do we have a bunch going on for September. Hmm…where do I start. Oh I know. First, I want to say a big thank you and a fond farewell to Heather. She happily agreed to be our first guest DT member. For the past 3 months, she has wowed you with her projects and videos. Stay tuned, she has a few more fab projects to share before the month is over. Thanks so much Heather. I’m sure you will see her around the Cafe. Annie will start with our September kit. If you aren’t familiar with her work, let me tell you she is amazing. I have seen her projects with the September scrapbook kit and they are outstanding. Annie will be on the blog later this week to do a formal introduction of herself, so make sure you stop by and give her a warm welcome. Speaking of the September kit, if you are a subscriber kits will begin shipping this week. Most of you will probably have them for the long weekend. If you want in on any of the kits, subscribe now. For the full reveal of all our kits, come back on September 4th. We will be having our first blog hop. There will be prizes and maybe a few other surprises. That’s all the September happenings I have for today. Thanks for stopping by. I’m back today with a layout created using the Mintay papers from the August main Scrapbook kit from Tres Jolie Kits. I have also used the sketch again for this layout. For my layout the other day I turned the sketch around, this layout I have left in the format it was designed. As usual my paper layers are all torn edges and they are inked too. I did the broad band across the middle with a lovely floral paper and highlighted it underneath with a piece of the blue lace. The balloon chip board piece I have painted with gesso and then edged it with the same ink I inked the papers with. My photo is layered up with some of the journal cards cut from the 12×12 paper. I curled some of the corners for extra detail. I did a little fussy cutting of the pink flowers buds with the blue butterflies to add to my flower clusters. My journaling (all be it small!) is fussy cut from the journal cards, distressed and inked. Thanks for stopping by today, I hope you have fun creating with this August Kit. I cannot wait to see what you all do with the kit! 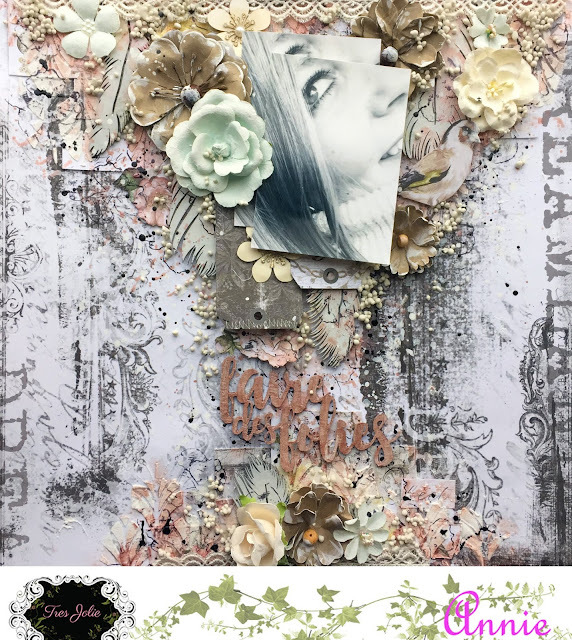 First off, I just want to say that Kim, the owner of Tres Jolie Kits has put together some amazing kits that are filled with MANY beautiful things, and if you love gorgeous, elegant papers and embellishments, you will love these kits! We are so excited for our first reveal, June 1st! This week we are introducing our designers and guest designers, so be sure to check the blog every day this week so you can see who we are, and some sneak peeks of the projects we are working on. So, I’ll kick off the introductions: My name is Rae and I live in Las Vegas, Nevada with my family- husband, three kids, and cat. I used to be a high school English teacher, but now I work in the pharmaceutical science industry as an editor, and I get to do that from home! Be sure to check the blog tomorrow so you can meet another member of our design team and see another sneak peek of what you can buy in June! Author RaePosted on May 21, 2018 May 20, 2018 Categories Behind the scenesTags design team, June kit, Sneak Peeks5 Comments on Design Team Introductions!